Following- some seem to think it is a rather mindless activity. They are wrong. Following involves intricacies unthought-of by many a dancer. In my experience there are two main goals to following. The first is listening to your partner. This is not listening with your ears, but with everything else in your body. It is your posture. It is where your weight is placed. It is what you are looking at. It is a state of utter readiness. Your posture needs to be correct in order to follow correctly. Ever notice that your ability to dance decreases in direct proportion to how tired you are? That is partly because your tiredness means that you are moving and dancing halfheartedly- the first thing you let go is your posture. What exactly does your posture need to be? Let’s start at the bottom: your toes. You need to be on them. If you are standing with your feet together, your heels need to be able to shift from side to side without you having to adjust anything in your weight. Therefore you need to be leaning forward. I have always found the higher my heels are off the ground the better my salsa technique becomes; as the saying goes- Nose over Toes. If you draw a line from your nose perpendicular to the ground, that line should be well past your toes. This leads to two results. Your technique improves incredibly and you get beautifully shaped calf muscles! Added to you posture needs to be your core muscles (stomach muscles). These need to be engaged (somewhat clenched). This helps with balance and keeps you centralised. It is rather difficult to be aware of your core muscles in a dance, therefore this needs to become muscle memory. It needs to be practiced. Keep them engaged all day- when you walk, talk, sit and work. Moving further up, your chest and shoulders need to be upright and rolled back. When you are standing with your nose over toes, lift your chest as if you are proud of them then role your shoulders back and keep them there. It feels strange at first but later you’ll feel like you’re a dancer! Why is this posture so important? Without it, you will be unbalanced and your weight will be all over the place and thus you will not be able to follow the steps your partner has in mind. Another part of listening to your partner is what you are looking at. If you are looking at the people watching you, it is very likely that you are thinking only of yourself. Self-consciousness; be it from pride or from embarrassment will kill the dance. If you are looking at nothing in particular, it is very likely that your mind is elsewhere, go there or let it go and focus on the dance. Your eyes need to meet your partner’s eyes. This is true for leads and followers. They must meet the eyes of the other as much as is physically possible. 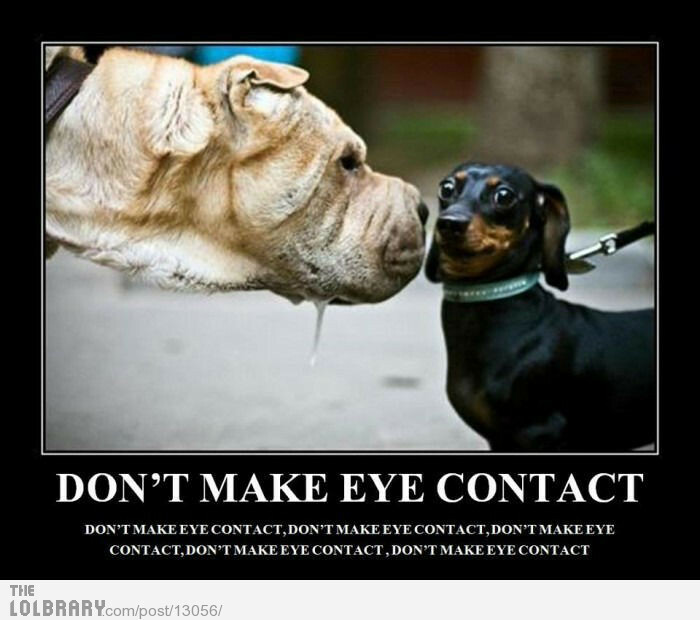 Eye contact opens up the lines of communication. It makes you aware of his movements and more aware of his lead, and thus your following improves. It also leads to smiles, laughs and sometimes even giggles which always perks up a dance! There are of course those leads who simply refuse to look at you. If you find yourself dancing with such a rude creature, you’ll have to make do with focusing on his nose or the center of his chest (depending on his height and yours) as much as possible. This at least will keep you aware of his movements, even though the human connection has been utterly lost! The second goal to following is listening to the music. At the most basic level, you need to be on the beat- that is (in LA Style Salsa) your right foot hits 1, your left foot hits 5 and you have your quicks and slows in all the right places. Hopefully your partner is also on this beat. If you are having an unfortunate dance and he is not, it is your unhappy task of finding the beat that he is on. This may mean NOT listening to the music. Moving away from such sad thoughts let’s focus now on the music. Salsa music is intricate, there is a lot happening in each song. Some people, who heard salsa for the first time, commented that it sounds like noise. If you listen to salsa often enough and become much more intimately acquainted with it, you’ll learn to pick out the different instruments and hear the tunes and beats that each instrument is adding to the song. Part of this is also learning to distinguish the different highlights. These are the “special moments” in the song. They can be one particular beat or note or they can be a pattern repeated once or twice in the song or every so often. Part of following is being able to “hit” these highlights without it affecting your partners lead in any way. Thus you “hit” them by moving you arms (if they are free) or your hips, legs or feet, shoulders and sometimes even your chest or bum to the rhythm of the highlight. Therefore you use any part of your body which your partner is not using at that time. We call this styling. Styling often happens without the highlights of the music. But it is best and at its most beautiful when the styling and highlights become one and the same. This takes time and practice to perfect. It takes lots of time and lots of practice, especially because it may not affect your partner’s dance. Listening to your partner can only be practiced when you are dancing with someone- in a class or on the social dance floor. This is also best practiced by dancing with many different leads of many different levels. Listening to the music needs first to be practiced off the dance floor. You need to get to know the genre intimately. Listen to it all the time. In the car, in the shower, when cooking, when cleaning (it makes cleaning so much more fun!) when chilling, and if you are able to, when working as well. While you are listening during your daily routine, hit the highlights whenever you can. While soaping up in the shower, hit the highlight with your free hand. While driving, use your shoulders or a chest pop. When you reach the level of highlighting while queuing in the shops, you know you are getting somewhere. Once you get used to what the highlights are and you start hitting them on your own then start adding them to your dance while following your partner. Soon you will be doing what I love to call PLAY. Just Dancing Salsa is teaching L.A style salsa in Cape Town! We teach at Barbosa Social Cafe at the Waterfront! Classes are on Tuesdays and Wednesdays weekly! Check out our FREE Sunday night beginners class and our Sunday Night Salsa Party at Barbosa! For more information contact us or check out our website.